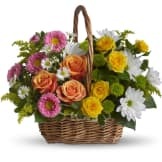 The Love's Tapestry Basket is a gorgeous way to send caring thoughts, and hopes for brighter days ahead. 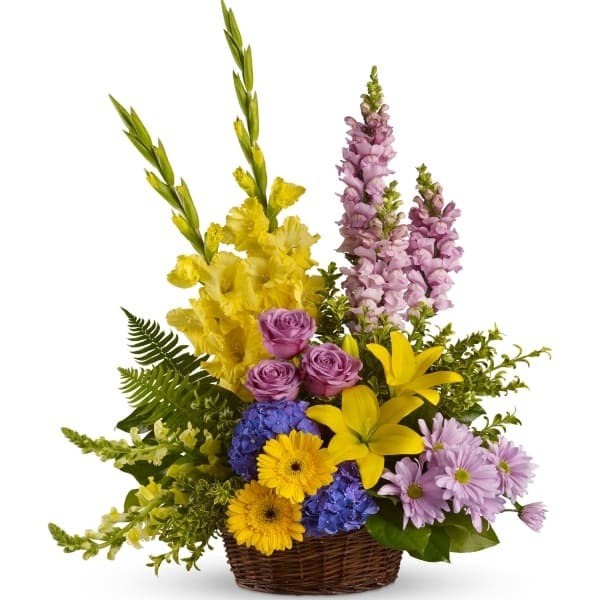 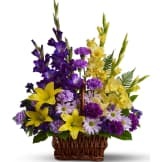 • Beautiful flowers such as blue hydrangea, lavender roses, snapdragons and daisy spray chrysanthemums along with yellow asiatic lilies, gerberas, gladioli, snapdragons and brilliant greenery are delivered in a lovely wicker basket. 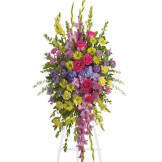 • Arrangement measures approximately 23 1/2" W X 31" H.
Flowers will be received by a The JF Floyd Mortuary's staff. 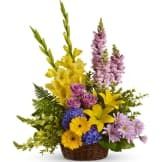 All of our flowers are designed and delivered by hand from a local florist in in Spartanburg.